A year later, I finally got around to it. However, all was not rainbows and unicorns. What? How could my 802.11n wireless network be slower than the 802.11b/g network? This made no sense. And it wasn’t just a little bit slower. Oh, no. It was noticeably slower, almost by a factor of 3. I tried changing the wireless channel and physically moved the unit assuming there was some kind of interference, but neither resolved the problem. My ping times to the AirPort Extreme were wacky. I was getting huge deltas ranging from 1 ms through 900 ms. They should have all been around the 1-5 ms range. I browsed all of the AirPort Extreme’s settings using Apple’s AirPort Utility program and that’s where I noticed the problem. It’s a sneaky little bugger and one that I’ll have to admit, I didn’t really understand at first. Shhhh, don’t tell anyone. There’s a setting under the Wireless Options called Multicast rate and it defaults to 2 Mbps but has options for 1, 2, 5.5 and 11 Mbps. Mine was set for 11 Mbps. Most people, including myself, would think that higher is better. But in this case, you’d be very, very wrong. I remember the factory default setting for this option was 2 Mbps, not 11 Mbps. I’m not sure how or when this option changed, but I assume that I thought what most people would think when they see this option; a higher number meant more bandwidth. I hate not knowing what an option does, so I read up on it. What exactly does the multicast rate do and what affect do the different settings have on your wireless network? Essentially, the multicast rate is the minimum speed that a wireless device must be able to communicate at in order to connect to the router. It’s a Quality of Service (QoS) setting that only allows devices to connect to it based on this criteria. So, the lower the multicast rate, the further away, or more accurately, the weaker the wireless signal, are allowed to connect. Higher multicast rates mean that only close, strong signals are allowed. 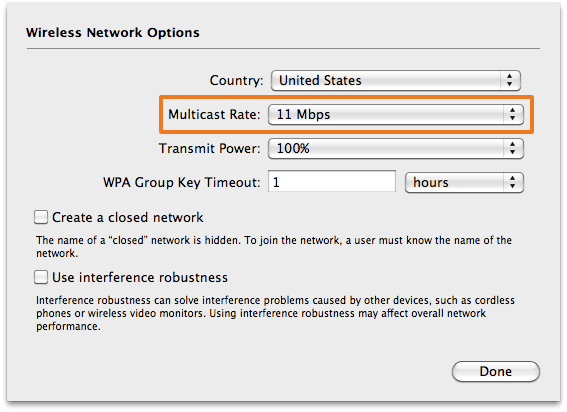 Multicast is asking what’s the minimum quality that is needed to allow a device and your AirPort Extreme to maintain a connection. Therefore, turning up your multicast rate will decrease the range of your wireless network. If you are experiencing your wireless devices constantly losing their wireless connections, and then restoring those connections automagically seconds later; check this setting. It’s probably too high. I changed this option back to 2 Mbps and my screaming fast network is back. I was about to write a post about this based on my response to Jeff in the comments. No need, Tired Donkey has done a wonderful job. I did the same thing with my older 802.11n AirPort Extreme and an even older 802.11 b/g AirPort Express that I have wired directly into my AirPort Extreme. Terry Blanchard, how do you set up two networks? Also my 5GHz Network Name is not check. Should it be check? I like your set up with two networks and would like do the same. Thank you for taking the time to explain this especially to those of us that are not IT Specialists lol. It has helped tremendously, and perhaps you should think about a possible career change! Thank you again, and I feel very fortunate that I discovered this article! Really easy to understand. nice way of explanations. Thank you terry… You explained this issue so easily and clearly. I’m sure this will fix my issue.